← Happy Martin Luther King, Jr. Day! Annie Oakley, the iconic American champion sharpshooter and trick-shot artist, was born Phoebe Ann Moses in a rural western border county of Ohio. Oakley’s amazing talent and timely rise to fame led to a starring role in Buffalo Bill’s Wild West show, which propelled her to become the first American female superstar. 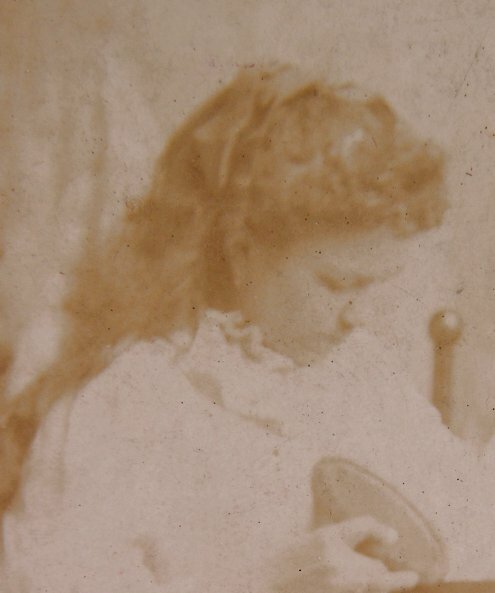 Born in 1860, Annie was the sixth of Jacob and Susan Moses’ eight children. Her father, who had fought in the War of 1812, died in 1865 at age 65 from pneumonia and overexposure in freezing weather. Her mother married Daniel Brumbaugh, had a ninth child, Emily, and was widowed a second time. In 1870, Annie and her sister were admitted to an orphanage and within a few months she was “bound out” to a local family to help care for their infant son, on the false promise of fifty cents a week and an education. She spent about two years in near-slavery to them, where she endured mental and physical abuse. She would often have to do boys’ work. One time the wife put Annie out in the freezing cold, alone, to survive. Annie referred to them as “the wolves.” Even in her autobiography, she kindly never told the couples real name. When, in the spring of 1872, she reunited with her family, her mother had married a third time, to Joseph Shaw. Annie began trapping at a young age, and shooting and hunting by age eight to support her siblings and her widowed mother. She sold the hunted game for money to locals in Greenville, as well as restaurants and hotels in southern Ohio. Her skill eventually paid off the mortgage on her mother’s farm when Annie was 15. Oakley soon became well known throughout the region. During the spring of 1881, the Baughman and Butler shooting act was being performed in Cincinnati. Traveling show marksman and former dog trainer Francis E. Butler (1850–1926), an Irish immigrant, placed a $100 bet per side (roughly equivalent to $2,000 of today’s money) with Cincinnati hotel owner Jack Frost, that he, Butler, could beat any local fancy shooter. The hotelier arranged a shooting match between Butler and the 15-year-old Oakley. The last opponent Butler expected was a five-foot-tall, 15-year old named Annie. After missing on his 25th shot, Butler lost the match and the bet. He began courting Oakley, and they married on June 20, 1882. The couple never had children. In 1885 Butler and Annie joined Buffalo Bill’s Wild West – and the rest, as they say, is history! The photograph depicts a young, female trick shot artist working with what appears to be a clay pigeon on the stock of the pump action Colt 22 caliber rifle. 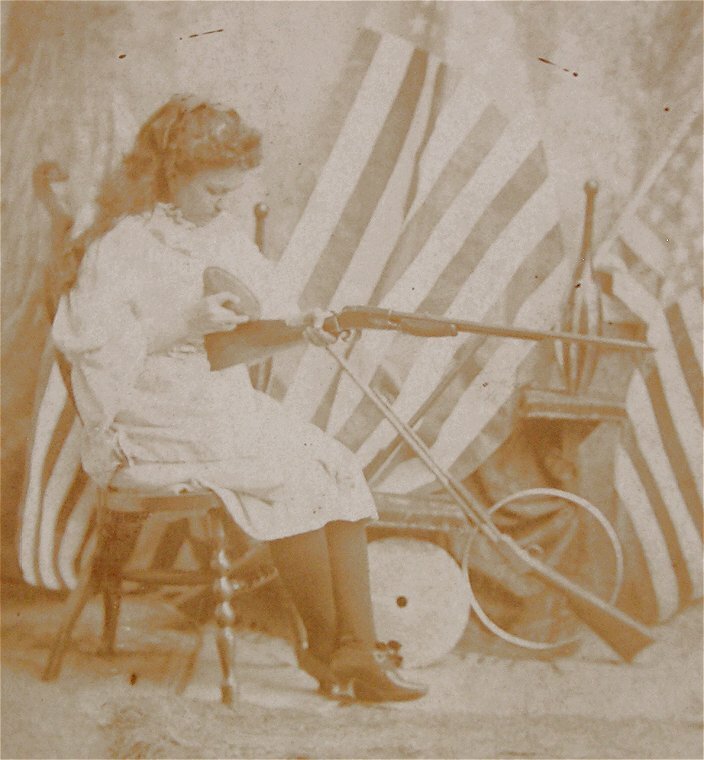 She is seated on a chair and holds the rifle straight out in front of her. Behind her is a painted background and an array of American Flags. 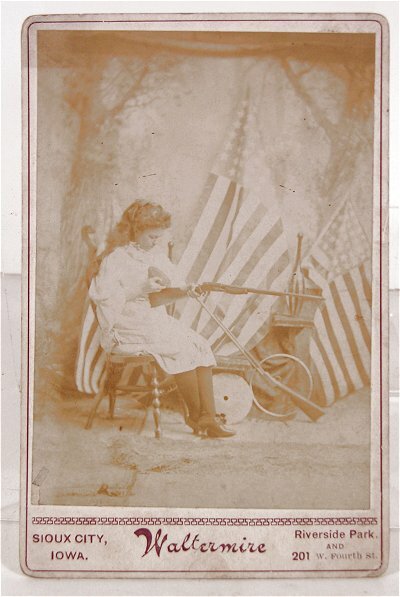 To the right of the young woman we see a second target rifle and a number of targets and other accouterments, which one would associate with a trick shot artist in a Wild West Show. The mount is also printed with the photographer’s credits of Waltermire of Sioux City, Iowa. We know that on September 22, 1896, Buffalo Bill’s Wild West (with Annie Oakley as a member of the cast) performed at Sioux City, Iowa, and it is entirely possible that this is when the Photograph was taken. Because this image has never been seen before, and the sharpshooter pictured is not identified in any way, we, as yet, cannot state definitively that the young woman pictured is “without a doubt” Annie Oakley. It seems almost impossible to believe that there was another female sharpshooter, who resembled Annie Oakley to this extent, that would have been photographed in the manner seen here, and who was of such notoriety that the photographer felt it unnecessary to identify in any way. If you’d like to learn more about this piece, further details can be found at our eBay listing. This entry was posted in Americana, Photography and tagged 1880s, 19th century, annie oakley, antique photography, buffalo bill, cabinet card, colt rifle, frank butler, historical discovery, rare photograph of annie oakley, sharpshooter, trick shot, wild west art, wild west show. Bookmark the permalink.